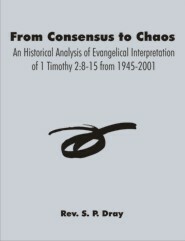 Evangelical interpretation of 1 Timothy 2:8-15 (certainly at the level of detail) has, in the period from 1945 to 2001, changed from one of received consensus to confused plurality. This thesis provides an explanation of this phenomenon by identifying and analysing the influences within evangelical interpretation that contributed to and shaped it. (iii)	the developments which shaped the manner in which discussion subsequently took place and which contributed to the plethora of contemporary interpretations of 1 Timothy 2:8-15. In doing so it adopts a methodology which self-consciously combines both diachronic and synthetic approaches and is thus able (a) to isolate more effectively major trends and their development and (b) to provide a framework for a more rigorous analysis. The resulting study concludes (Section D) that evangelical interpretation of 1 Timothy 2:8-15 for the period from 1945 to 2001 was embedded in and shaped by contemporary social and ecclesiastical changes and by its own internal dynamics as it responded to these developments. In particular, differing responses to emerging theological, linguistic, historical and cultural discussions and to contemporary hermeneutical debates have proved decisive. While two broadly distinguishable (and conflicting) approaches developed, they spawned a plethora of different exegetical options and variant interpretations. Stephen Dray is minister of Ferndale Baptist Church, Southend-on-Sea, Essex, England and Visiting Scholar at Sarum College, Salisbury. He is Old Testament editor of the Crossway Bible Guides and Editor of 'Evangel': the British Evangelical review. He is the author of a number of books and e-books and many journal articles.